Enero | 2014 | Sana Ako si Ricky Lee! While I truly believe that the WISH FULFILLING AND BUDDHA’S BLESSING MANTRA pendant that I originally designed for myself has become a very powerful Feng Shui and Buddhist amulet that is a vehicle for people to receive miracles, I still get surprised with the wonderful testimonies that I receive everyday from people who has requested for it. Allow me to share another such story. But this time, I will not hide the name of the person will use her real name and not just her initials, because she has written about her experience in one of the leading newspaper in the country. Allow me to post Marissa Ferrer’s story below, verbatim, as she has written it on the newspaper. But I just want to add that what’s so amazing here is that I didn’t even remember that I was able to predict the Bohol earthquake and Super Typhoon Yolanda ( Haiyan) that hit the Visayas region of the country. It was Marissa Ferrer who called my attention to it. As we usher in the start of a new year, everyone’s eagerly anticipating about what lies ahead in the coming months. From one’s career, money-making opportunities to health and relationships, so much can be speculated about how 2014 is going to be, hence the popularity of yearly forecasts, horoscopes and Feng Shui. As these are seen as a useful guide for people as they map out their plans for the year. For so many years and being a Christian, I used to be quite skeptical when it comes to fortunetelling and Feng Shui, however, recent life-changing events in my life has caused me to be more open about the idea. Last February, my mother was diagnosed with Stage 3 breast cancer, and if that wasn’t painful enough, she also suffered a stroke in the middle of her chemo therapy. That was the start of a long and tedious road to her recovery, which eventually took a toll on my and my sister’s health and wellbeing. As the hospital bills kept piling up, we also went through financial problems wherein we had to sell some of our properties just to cover the three months that she was in the hospital. To make things worse, I lost my job at the same time that I found out that I also have high blood. The company I was working for went bankrupt and had to let go of us. I was only able to contribute to my mother’s hospital bills thanks to the help of my loving husband. However, I can’t just rely on him forever as my sister is also not earning enough to help pay for the bills. With so little hope, this was the time when I was enticed by a friend to check out the website www.sanaakosirickylee.wordpress.com. I visited the site on the premise that it’s a useful Feng Shui site, in spite of the weird URL, it still piqued my interest. Given that I had nothing to lose, I went through the different entries and learned some interesting insights about my current misfortunes. Based on the Chinese astrological system, my mother and I were both born on the year of the goat. According to the blog, a lot of bad things will happen to those born in the year of the goat. To be specific, it was mentioned that people born under this sign like my mom and I, needs to be conscious of our health and finances. My friend encouraged me to e-mail the blogger, JP Tan, whom I later found out was an aspiring writer, who eventually developed a knack for dispensing Feng Shui advice. After a few unanswered e-mails, JP finally agreed to talk to me and discuss what I can do improve my current situation. He suggested that I get a Wish Fulfilling and Buddha’s Blessing Mantra Pendant. 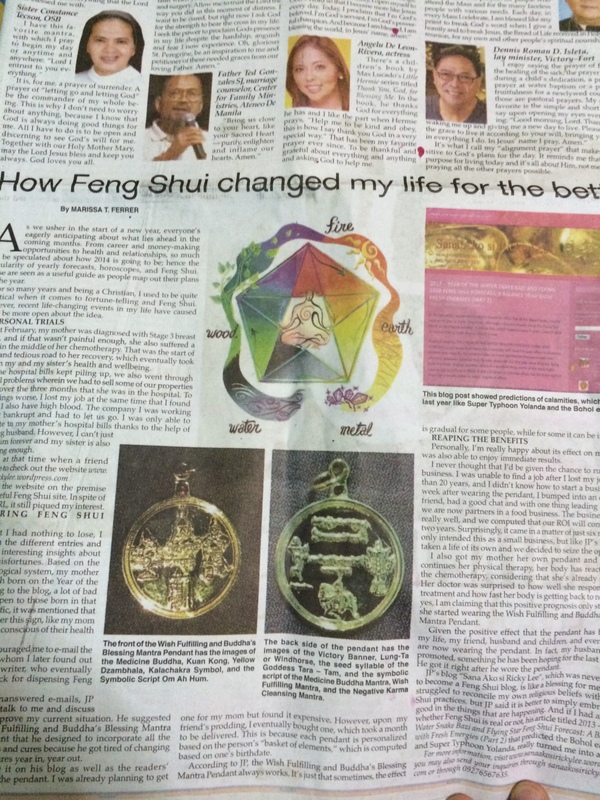 A pendant that he designed to incorporate all the essential enhancers and cures because he got tired of changing all his Feng Shui cures year in, year out. I’ve read about it on his blog as well as the readers’ testimonials about the pendant. I was already planning to get one for my mom but found it expensive. However, upon my friend’s prodding, I eventually bought one, which took a month to be delivered. This is because each pendant is personalized based on the person’s ‘basket of elements’ which is computed based on one’s birthdate. According to JP, the Wish Fulfilling and Buddha’s Blessing Mantra Pendant always works, it’s just that sometimes, the effect is quite gradual for some people while some it can be immediate. Personally, I’m really happy about how it’s effect on my life, as I was also able to enjoy immediate results. I never thought that I’ll be given the chance to run my own business. I was unable to find a job after I lost my job of more than 20 years, and I don’t know how to start a business. But a week after wearing the pendant, I bumped into an old college friend, had a good chit chat with one thing leading to another and we are now partners in a food business. The business is doing really well, and we computed that our ROI will be in about two years, but surprisingly, our ROI came in a matter of just six months. We only intended this as a small business, but like JP’s blog it has taken a life of its own and we decided to seize the opportunity. I also got my mother her own pendant and while she continues her physical therapy, her body reacted well to the chemotherapy considering that she’s already in her 70s. Her doctor was surprised to how well she responded to the treatment and how fast her body is getting back to normal. And yes, I am claiming that this positive prognosis only started when she started wearing the Wish Fulfilling and Buddha’s Blessing Mantra Pendant. Given the positive effect that the pendant has brought to my life, now my friend, husband and children, even my sister are wearing the pendant. In fact, my husband just got promoted, a promotion he has been hoping for the last two years and he got it right after he wore the pendant. JP’s blog ‘Sana Ako si Ricky Lee’, which was never intended to become a Feng Shui blog is like a blessing for me. At first, I struggled to reconcile my own religious beliefs with the Feng Shui practices, but JP said it is better to simply embrace all the good in the things that are happening. And if I had any doubts whether Feng Shui is real or not, his article titled – 2013 – Year of the Water Snake Bazi and Flying Star Feng Shui Forecast: A Balance Year with Fresh Energies (Part 2), which predicted the Bohol earthquake and Super Typhoon Yolanda, really turned me into a believer.